This week the theme over at i ♥ faces is "feet"! I haven't entered a photo in any of the last few challenges and since I had this photo on hand I thought I'd enter it since it fit the theme. This photo was taken with a p&s camera earlier this year before I got my dSLR. I think it came out great anyway! 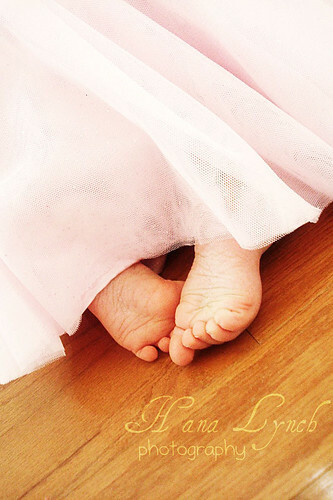 I love how Ella's toes are peeking out from underneath her tutu! How sweet! To see more great "feet" photos visit i ♥ faces! This photograph is so precious! I love her little toes peeking out from under the dress! Just precious! I love the texture that the tulle adds to the photo! Beautiful entry! ooo....cute...What is she up to? I agree, this is a beautiful entry. Point and Shoot? Bah humbug - you have shown that it is the photographer not the camera that gets great shots! So sweet! Love her little feet sticking out from under the tule skirt. Love the angle too! i love the colors. your pic is fabulous. I love so many of your pictures. They are beautiful. This one is so sweet and the tulle...I wish I had captured a picture like this with my daughter. naugthy little feet. it's hiding and says peek-a-boo!! !